One slight problem however was that Cerveja Diabólica really is a small microbrew, and one based some 200 miles away from São Paulo in the southern Brazilian city of Curitiba. It was then, going to be a little difficult to find out if Diabólica tasted as good as it looked. Fortunately, I very recently stumbled upon Beer4U, a company that delivers beer to your doorstop. Conveniently, they also have a small shop in the neighbourhood of Vila Madelena here in Sampa, and upon visiting I was pleasantly surprised to find, amongst a impressive selection of all sorts of weird and wonderful beers from Brazil and around the world, both of the beers that are currently produced by Diabólica. Where purchased: Beer4U (Vila Madelena, São Paulo). Established in Curitiba in 2009, Cerveja Diabólica started life as a DIY home-produced beer, but in subsequent years has grown to see its beers reach other parts of Brazil – most importantly (for me at least), as far as São Paulo. Nevertheless, it is still a relatively small microbrewery, with its beers actually being produced and bottled by Cerveja Bierbaum, a microbrewery based in the municipality of Treze Tílias in the neighbouring state of Santa Catarina. 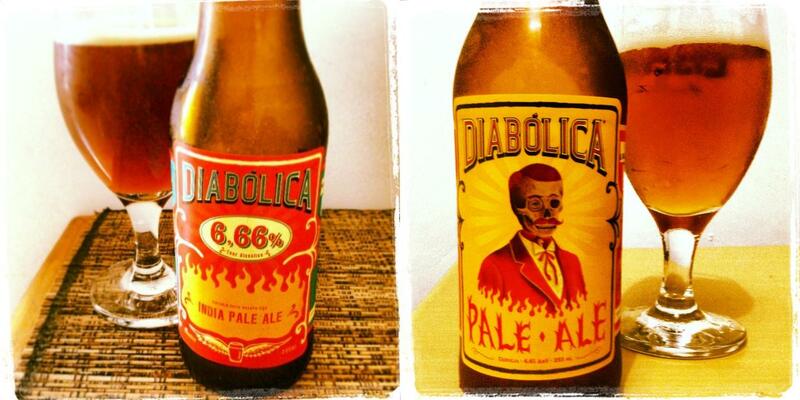 Currently, Diabólica only brews two beers, a Pale Ale and an Indian Pale Ale. Most importantly, what’s the beer like? Both of Diabólica’s beers are influenced by the English tradition of Pale Ales and IPAs, and both incorporate English hops in the brewing process. Given my propensity for bitter and hoppier tasting beers I decided to leave the IPA for dessert and for starters got stuck straight into Pale Ale. English Pale Ales (or bitters) tend to be amber or copper coloured, and are more balanced than their hoppier American cousins. The Diabólica version poured a nice amber colour and with a short-lived, thinly cream coloured head. A quick sniff provided some nice hoppy and malty aromas and these were replicated taste-wise. Certainly, less hoppy than an American Pale Ale and with a moderate alcohol percentage of 4.4% this is clearly a beer style upon a typical English bitter. Not outstanding, but certainly very drinkable. As for the IPA, it poured a slightly darker copper colour than the Pale Ale although the head was much the same. The increased hop content – as would be expected from an IPA – was instantly more noticeable both in aroma and taste, giving it a nice bitter aftertaste. It is balanced well, similar to Colorado’s Indica, but at 6.66% (as opposed Indica’s 7%) it’s slightly more forgiving. Overall, it’s a very enjoyable IPA. Recommended. 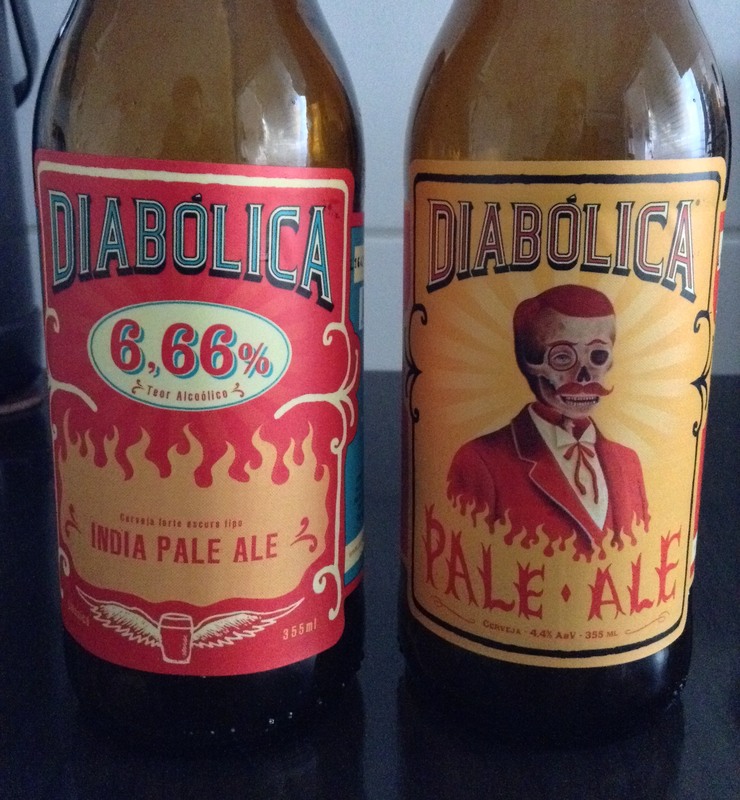 I’m relieved to report that neither of Diabólica’s beers let their marketing department down because both, particularly the IPA, taste pretty good. However, at R$11 and R$13 per 350ml it’s debatable as to whether they would trump something like the Indica (7% 600ml) as being a regular choice off the shelf. However, both are good additions to Brazil’s microbrewing repertoire. And, let’s face it, they do look bloody cool. I’m interested how a Brazilian would drink it , do they drink it at a similar temperature to real ale or more chilled like a keg beer or really cold like Brazilian lager. My hubby isn’t too keen on it too cold so tends to stick to lager when out and save these beers for home. Most places I’ve had these kinds of beers they’ve been served chilled regardless of what the recommendation is on the bottle. I once had to prevent one place chilling a London Pride, and got a very funny look!